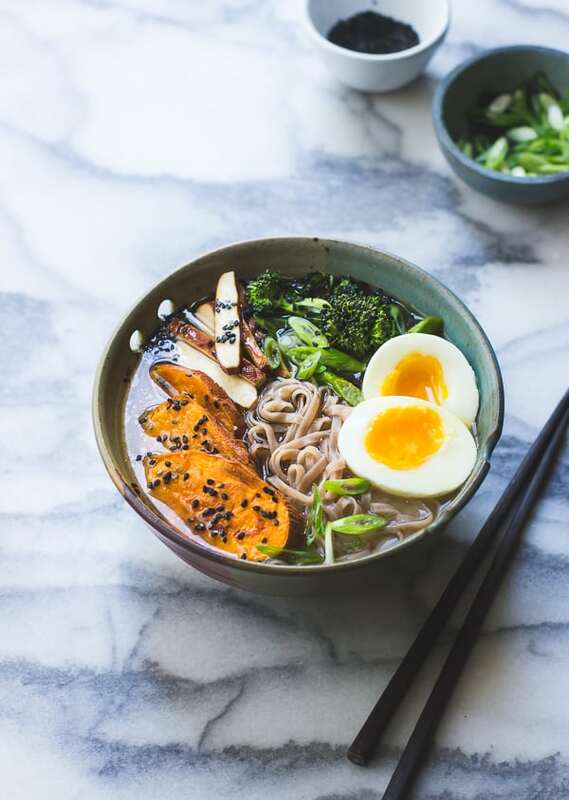 A ramen / pho hybrid, this vegetarian and gluten-free soup recipe starts with a gingery miso broth packed with brown rice pasta, smoky tofu, sesame broccolini, roasted sweet potato, and a softly set egg. Jay and I both got hit with gnarly colds over the holidays. I thought bowls full of deliciousness might help ease the blow of being sick as dogs on both Christmas and New Years. Hence these ginormous bowls of miso broth packed with goodies, which manage to feel decadent while being sneakily healthy at the same time. Also, much Prosecco and cocktail drinking is in order to make up for our holiday deprivations, don’t you think? I’ve been a little obsessed with brothy bowls of noodles and veggies as of late, and it seems I’m not alone. 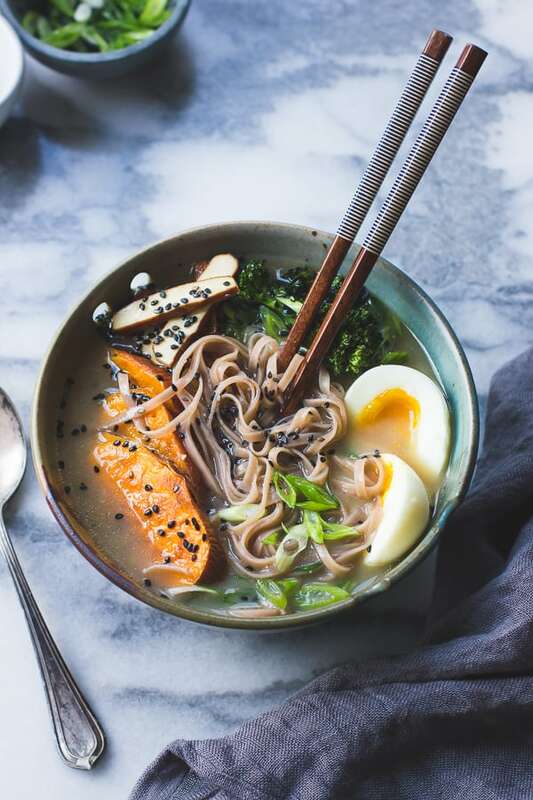 This recipe is a variation on a miso soba noodle soup that I made last year, which is currently my second most viewed recipe of all time! 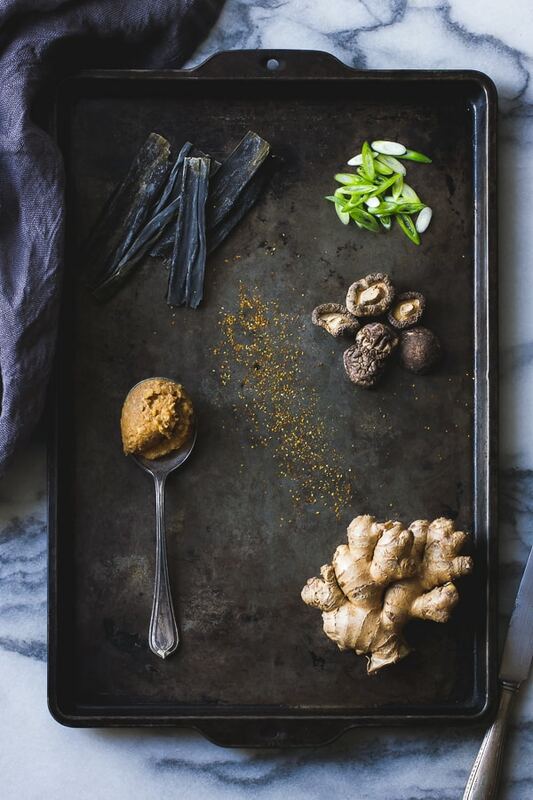 The broth is a simple infusion of kombu, dried shiitake mushrooms, and ginger mixed with sweet white or yellow miso and a bit of tamari. 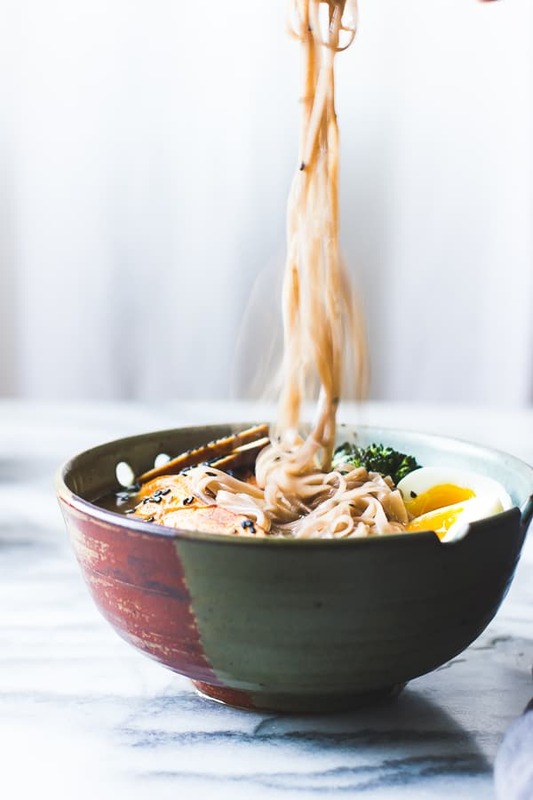 Sarah had the brilliant idea to make a ramen of sorts with rice noodles from Star Anise Foods, a local company that produces chewy brown rice noodles that cook in one minute, aptly called Happy Pho. They come seasoned with either green tea or seaweed. I went the seaweed route here to match the kombu in the broth; both add a briny minerality to the soup that reminds me of authentic ramen. Sarah also coached me in how to soft-boil an egg to perch on top, which I now I consider an essential addition. The way the broth mixes with runny yolk drives me wild. I’ve been craving sweet potatoes like nobody’s business, and these sliced slabs remind me a little of the pork usually served atop ramen. 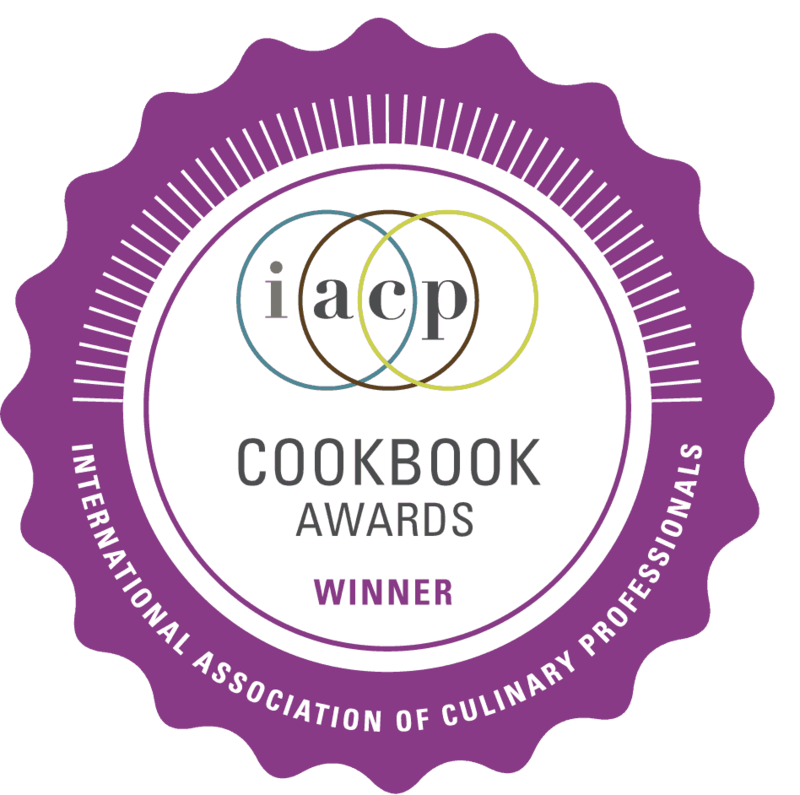 They add a sweet counterpoint to the savory soup. 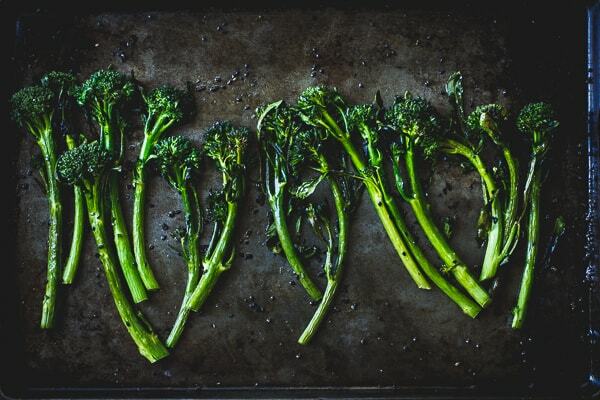 I add greens in the form of slender broccolini roasted with sesame oil and black sesame seeds. A pile of sliced smoky tofu from another local company, Tofu Yu, adds protein and umami. A bowl of this is steamy bliss. By now we’re both mostly recovered. 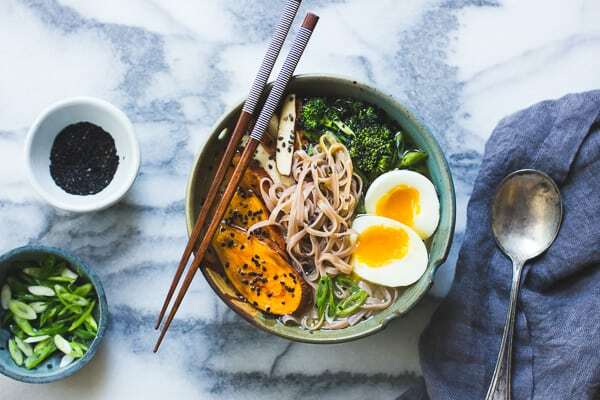 And I’m pleased to say that this soup is just as tasty when you are well, preferably preceded by gluten-free scallion pancakes, accompanied by a glass of sake, and chased with matcha ice cream. 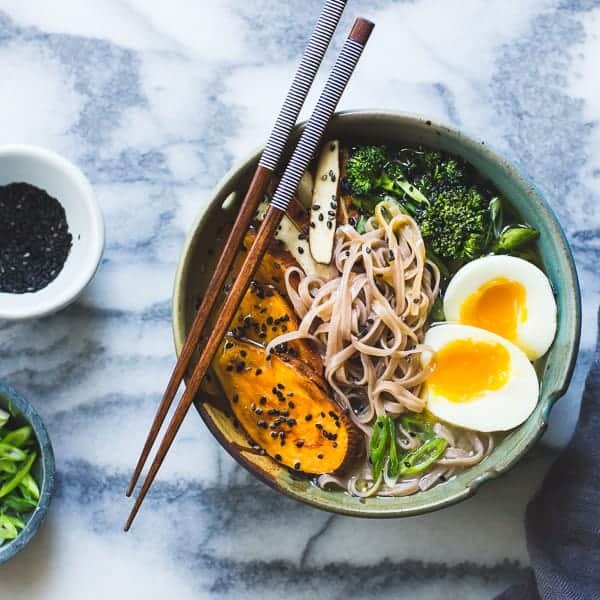 I love the combination of chewy rice noodles, smoky tofu, crisp-tender broccolini, and earthy sweet potatoes here, but feel free to play fast and loose with the goodies in this soup. The soft boiled egg is my favorite part, but you can leave it off for a vegan option. 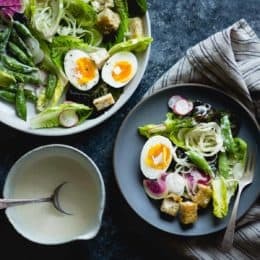 For technique on making soft boiled eggs, see this post from The Kitchn. 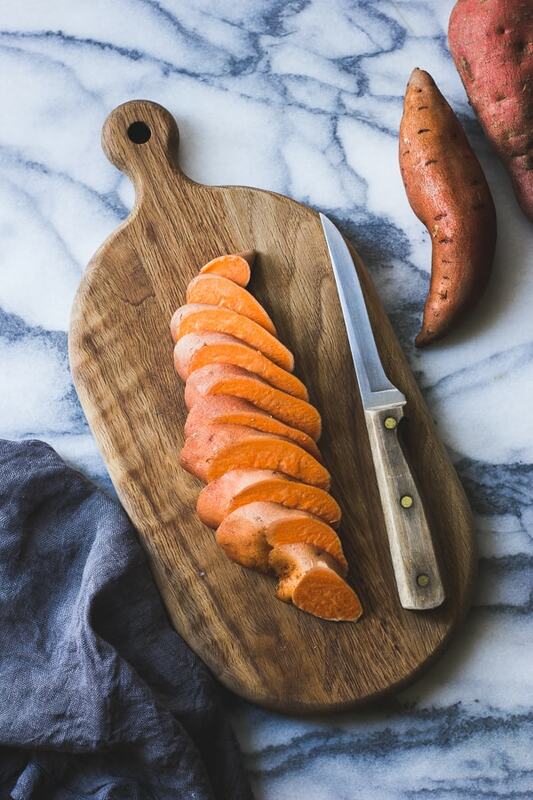 Scrub the sweet potatoes and slice them into half-inch thick rounds. Place on a baking sheet, toss with 1 tablespoon of the sunflower oil and a big pinch of salt. Roast until tender and bronzed, 25-30 minutes, flipping the slices over when the bottom sides are golden. Meanwhile, trim the tough ends off of the broccolini, give them a rinse, and lay them on a baking sheet with a bit of water still clinging. Drizzle and toss with the sesame oil and a few pinches of salt, then sprinkle with the sesame seeds. Roast in the oven until turning golden around the edges and crisp tender, 10-15 minutes. 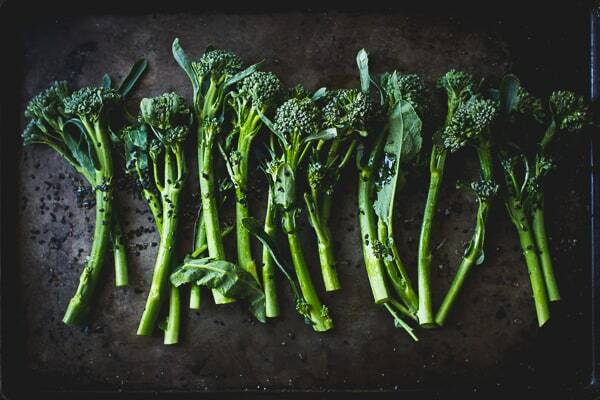 Cut each broccolino into 2 or 3 pieces. Cook the noodles according to the package instructions (I like to salt the water to give them a bit of flavor). Divide the noodles between four large bowls and top with a pile of broccolini, a fan of sweet potato slices, the tofu, and the scallions. Reheat the broth if necessary to just below a simmer and pour it over the bowls. Slice the peeled eggs in half and perch them cut-side up in the soup. Finish the bowls with a sprinkle of sesame seeds and a drizzle of roasted sesame oil. Serve with the ichimi togarashi for those who like a kick. Leftovers are best with the components kept separate (chilled airtight) and heated together before serving. 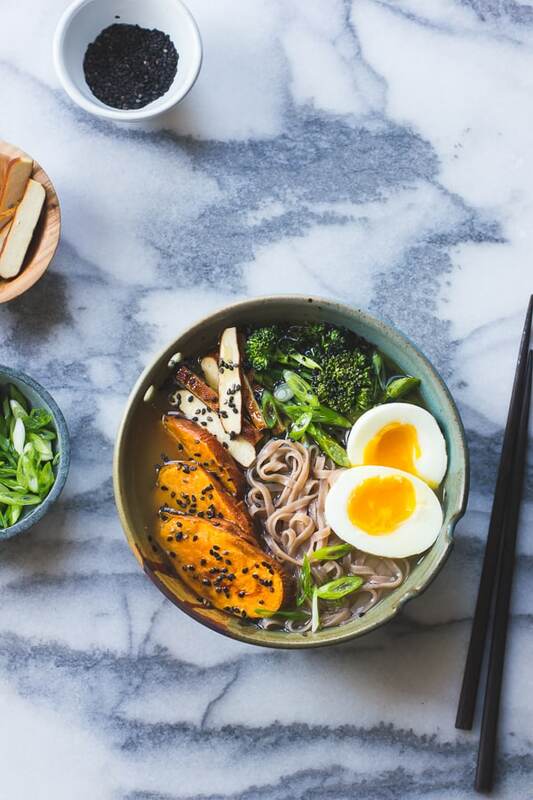 You had me at 'gingery miso broth'! What a perfect bowl of comfort. Also, so sorry to hear you guys spent the holidays sick! That's no way to welcome in the New Year. I'd be trying to make up for it by stuffing my face with baked goods. This definitely looks like it would fix you right up! Slurp slurp. Delicious! This is all I am craving right now. Um hello, this is EXACTLY what I've been craving!!! I went to a ramen place that had such an incredibly fatty broth that chunks of fat literally congealed on the surface…and that made me want to make my own. 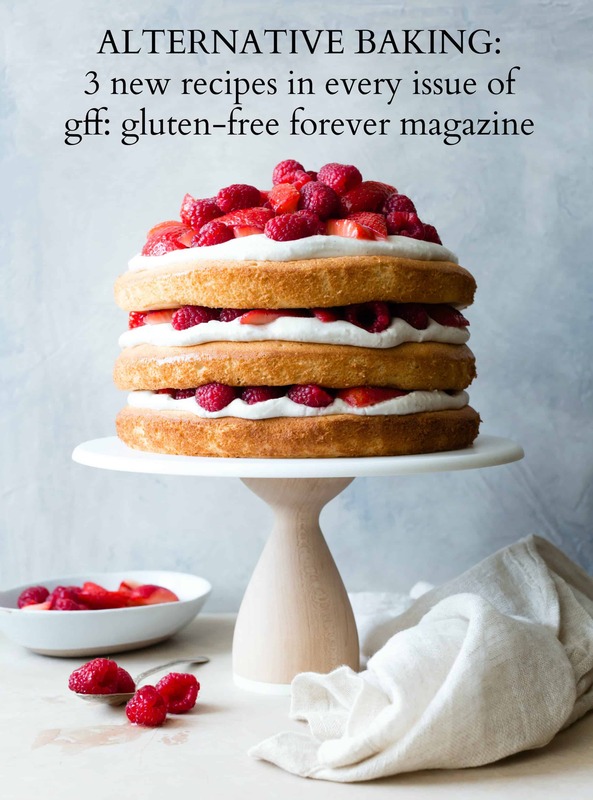 Thanks for the incredible-looking recipe–can't wait to try!!! Gorgeous gorgeous photos!!! This looks delicious. Thank you so much. Ah, thank you Amy! I hope you folks get some relief from the heat soon! Glad to hear you've recovered and catching up on your Prosecco drinking as I am in the same boat but I change it up once in a whole and throw in some Cava! This bowl is gorgeous I want to eat it so badly! That soft boiled egg with gloriously runny yolk makes it totally irresistible to me! Ah, you are too kind Kris!! I know it's kind of odd, but one of my absolute favourite things to do in a new city is shop at the local food markets for things that I don't have at home. My kitchen is full of things I've brought back from various travels. 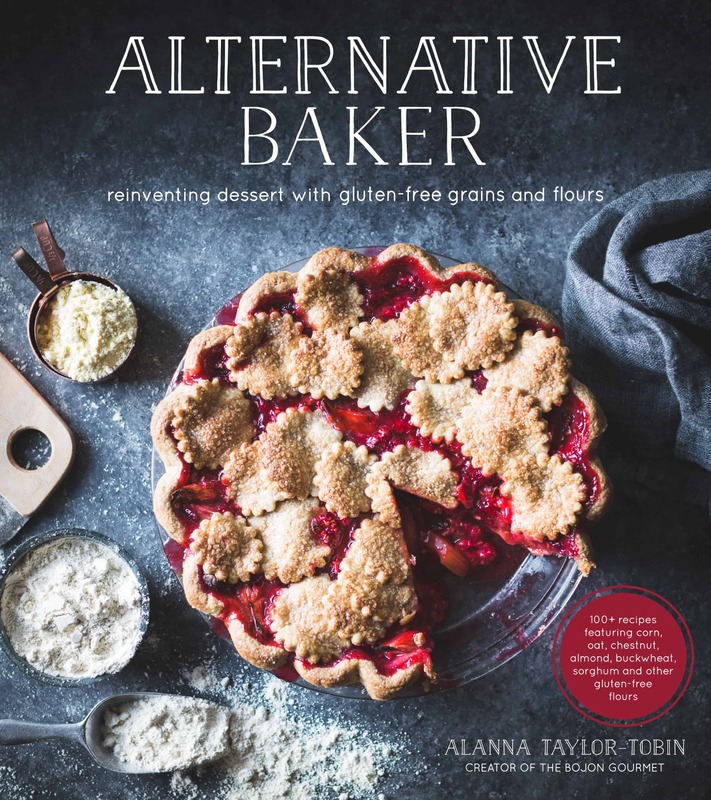 My husband and I will be in SF in a few weeks and you have no idea how excited I am to seek out some of the ingredients you've mentioned! Those noodles especially! 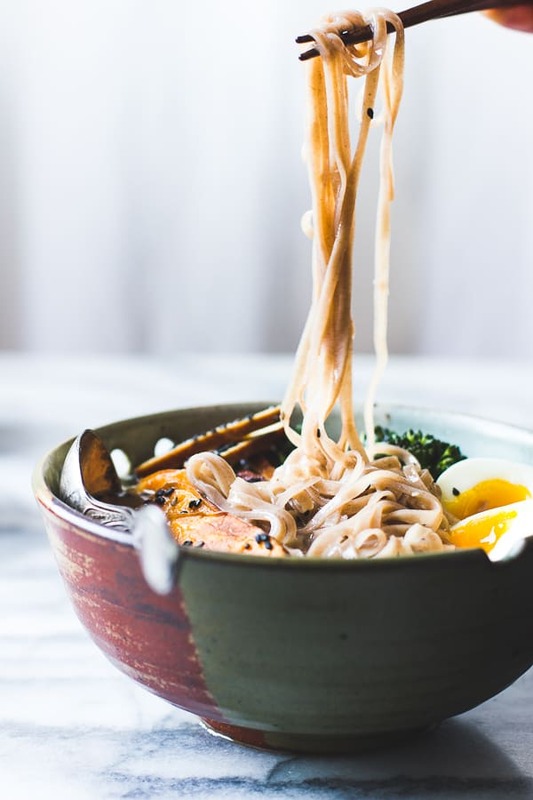 I've been sick lately too and that's led to lots of Netflix binges … a favourite has been Mind of a Chef, and there were lots of ramen noodle bowls that had us craving those yummy slurpy bowls topped with soft boiled eggs. Your timing couldn't be better! Yes! I love to do the same! Mind of a Chef is in my queue and now I'm extra excited to watch it, with a steaming bowl of soup, of course. Hope you're feeling better and safe travels! I'd love to meet up when you're here in the Bay! I made this last night. My family loved it. Thank you for the recipe! I'm so glad to hear it. Thank you for the note! I'm really not a fan of tofu. Soy products in general I feel should be avoided, except miso which is fermented. 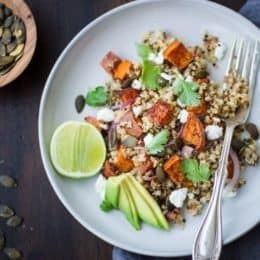 Any protein alternatives you would recommend? Looks wonderful! I love your other miso soup with tofu, shiitake mushrooms and kale. Please could you advise what to do with the tofu though? 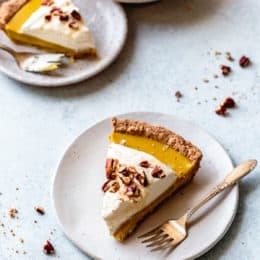 Not clear from the recipe whether it is cooked or just added raw, unless I’m missing it. Thanks! Yeah! This tofu works when added raw, letting the hot broth warm it through, but feel free to fry or roast yours if you prefer. :) LMK how you like it!